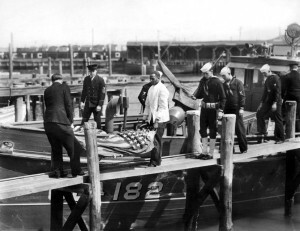 Search for the Navy Zeppelin Akron that crashed during a storm 27 miles off Beach Haven, New Jersey, April of 1933. July, 1986. The story of the Akron and her naval sister rigid airships the Macon and forerunner the Shenandoah grip the imagination. Once I began researching the early airships and their often tragic endings, I became hooked. The Shenandoah’s crash site in Noble County, Ohio, is well known and marked by a memorial. The Macon went down in deep water off Point Sur, California, in 1937. And so the Akron became NUMA’s prime target, especially since she crashed in only 105 feet of water and took 78 men with her, including Admiral William Moffett, considered the father of Naval aviation. My NUMA crew consisted of A1 and Laura Ecke, owners of our search boat; Dr. Ken Kamler, team physician and diver; and Mike Duffy, diver and oceanographer; and old dependable Bill Shea. We gathered at a motel in Beach Haven on July 27., 1986. I flew in while some drove. The Ecke’s came down from Long Island on their boat. We were knocked out three days by bad weather and fog, but managed to get in 29 hours of solid search time. I used the position from the log book of the navy salvage ship Falcon as a the basis for a search grid. Unfortunately, a woman who was to do a report of the expedition for us departed to parts unknown with most of my research material. However, I do have the Loran coordinates that run on an east to west line at the southern end of the debris field. If you should decide to check out the Falcon’s log over the wreck site, be advised that the description of another salvage ship’s buoy (I can’t recall her name) 400 yards to the northeast is pretty much on the money. We did, contrary to one newspaper report, get a dive down on one target, which proved to be the base of one tail fin. I was not on board that day to direct the operations so the Loran reading is off by about a hundred yards due to the crew’s late reaction to the cry of “Target!” and the fact they never got the hang of allowing for the distance between the sonar recording unit the sensor trailing nearly 150 feet behind. Be that as it may, Loran coordinates 43076.7 by 26724.9 and 43076.0 by 26726.7 should put you in the southern end of the ballpark. There is an excellent story on the expedition in the August 8th issue of the New York Times. The Akron is a ship, a ship of the air. 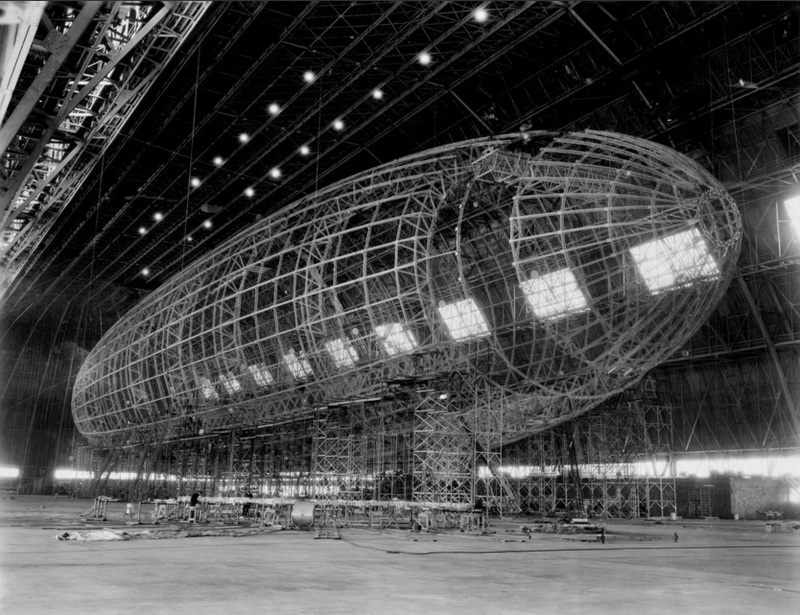 Because of the proximity of the Lakehurst Naval Air Station, and the sheer amount of traffic originating there, quite a few dirigibles have dived into the sea over the years. During W W 2 they were a common sight in the sky as the lighter-than-air craft patrolled coastal shipping lanes for German submarines, lost seamen, and downed pilots. Two Akrons have been lost off the Jersey shore. The first one was a private venture operating out of Atlantic City. On July 2, 1912, the 258 foot semi-rigid airship began an attempt try cross the Atlantic. Melvin Vaniman, designer and engineer, steered the ship over Absecon Beach and headed north toward Brigantine. The trip barely began when, in front of the eyes of thousands of horrified sunbathers, 400,000 cubic feet of hydrogen burst into flames. The Akron crashed into the water, killing all five aboard. The Z R-4 was built in 1931 in the largest hangar in the world, in Akron, Ohio, under U.S. Navy contract. 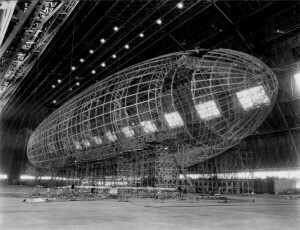 The giant rigid dirigible was 785 feet long, and boasted 6,500,000 cubic feet of nonflammable helium in 11 gas cells. Instead of external engine pods, the 8 gasoline engines were set inside the hull with the propellers mounted on variable pitched outriggers. On August 8 the Z R-4 was christened Akron, but within weeks became more popularly known as the “Queen of the Skies.” During the next 2 years she made 58 successful. flights, crossing the country many times. People were awed by her size, beauty, and streamlined profile. The Navy was proud too have such a ship, and made no pretense of showing her off. Her reputation was somewhat tarnished on May 11, 1932, during a landing at San Diego. A combination of events caused the airship to bob back up in the sky with three ground crew men clinging to the ropes. Two fell off and were killed, one was reeled up to safety. Her final demise came during a short protocol hop. When a bong flight along the New England coast was cancelled due too weather, some of the Navy brass decided to take a quick tour of the skies. Among the 76 crew and passengers were Admiral William A. Moffett, Chief of the Bureau of Aeronautics, and 6 survivors from the Shenandoah crash. The Akron took off at 7:30 p.m., in a pea soup ground fog. By the time she reached 300 feet she was out of sight. The round trip was planned to take them to Philadelphia, the Delaware Capes, and up along the coast. She soared over the City of Brotherly Love in crystal clarity. By midnight, nearing the end of the flight, a storm caught up with her off the coast of Atlantic City. Surrounded by thunder and lighting, she was pummeled by fierce winds. Girders cracked, and gas cells burst. The airship plummeted down, and struck the ocean stern fist. Men fought their way out of the sinking framework as the dirigible sealed to the bottom. The Akron did not burn, but her navigation lights were by the Phoebus, a German tanker. Captain Karl Dalldorf, master, watched the lights near the water. He thought a plane must be crashing, so he altered course to investigate. In 45 knot winds and heavy seas, he found 5 men clinging to a 120 gallon fuel tank. He veered his ship in sideways. Two men swam toward the tanker, caught life rings, and were hauled aboard. A lifeboat was lowered and 2 others were plucked off the makeshift raft. But during the hour and a half wait one man had been unable to hang on, and had drowned. Then, one of those rescued succumbed to his exertions; he slipped into unconsciousness and quietly passed away. Commander Frank McCord, skipper of the Akron, and Admiral Moffett, went down with the airship. 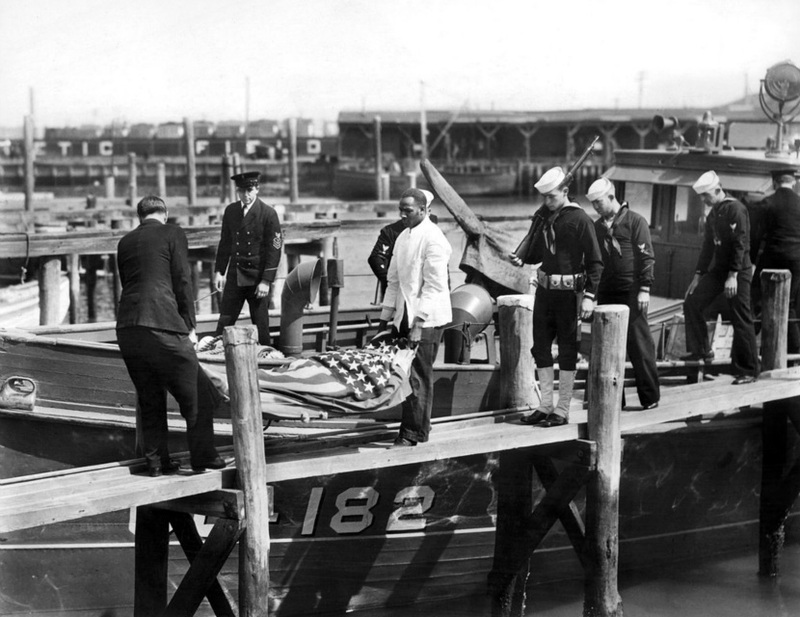 The 3 survivors were transferred to the Coast Guard destroyer Tucker and taken do the Naval Hospital at Brooklyn. Moffet’s body eventually washed ashore. The death troll was compounded later that day when the 2 engine blimp, the J-3, set out to look for survivors. She cruised the coastline between Barnegat and Atlantic City, fighting vicious winds all the way. As she was backtracking the route the port engine shifted off its mounts and had to be shut down. The airship lost altitude, and came into Beach Haven for an emergency landing. The seven man crew dropped hang lines and released helium, but a gust of wind slammed the blimp into the dunes. She rebounded, was carried a thousand feet offshore, and crashed into the surf. The gondola was torn off and the men dropped into the waves. A New York City amphibious police plane saw the accident, landed in the water, and rescued 5 men. The other 2, including the blimp’s skipper, Lieutenant Commander David Cummins, drowned. The famous salvage vessel Falcon, that had among other things raised the submarine S-51 under the leadership of Commander Edward Ellsburg in 1925, was called in. She located the wreckage and recovered enough material to make a positive identification. In 1986, the National Underwater and Marine Agency, headed by author Clive Cussler, located by side scan sonar what he believes to the wreckage of the Akron. 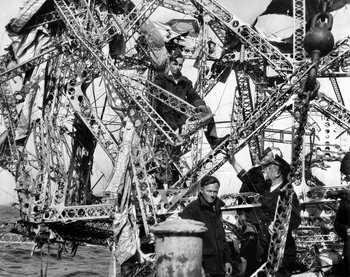 Although no divers were sent down to explore the wreckage, electronic equipment was able try record a 700 foot debris field consisting of beams and metal frames.